No more Google keywords provided! How to unlock “Not provided” keywords in analytics reports? AFS Analytics provides an innovative solution with an algorithm using artificial intelligence and data provided by Google Search Console. Today, secure searches account for 95% of Google's traffic. The other search engines follow the same trend. Keywords or search terms don't show in the referrer's URL, so the web analytics services, including Google Analytics, cannot collect this data for their clients, and display the message “Keyword not provided”. Some search terms or keywords can be obtained through the “Google Search console” tool, formerly known as Google webmaster Tools or via an API . A few days waiting period to get search terms. A history limited to 90 days. The impossibility to link the search term to the visitor. The obligation to connect to “Google search console”. 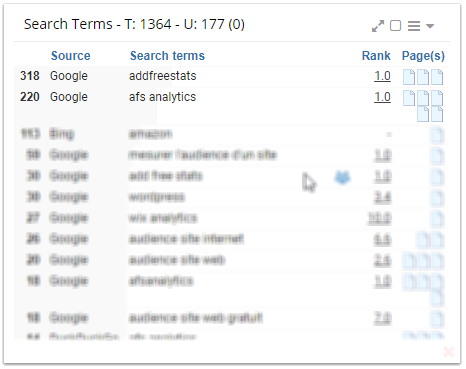 Using artificial intelligence to recover the search terms "not provided"
AFS Analytics developed an algorithm able to recover in real time the search terms used by each visitor. Thanks to artificial intelligence, the recovery becomes more accurate and powerful over time. The algorithm captures the data from your website and from your “Google Search Console” account. This feature is available but limited with the free plan. The Silver and Gold plans offer a more powerful algorithm and a larger history. For each keyword, additional information is available: position, linked pages, popularity, etc. Moreover, AFS will Import data from your “Google search console” account so you can directly display them on AFS Analytics. Detects and predicts search terms in real time. Shows history of search terms and search engine positions. Shows search terms used by each visitor. Shows data provided by the “Google search console” tool on the Dashboard. Rebuilds the referrer's URL including the keywords used. 1 . Create an AFS account if you don't have one yet. a. If you don't use AFS Analytics on your website, create a free account or install the AFS Analytics plugin for WordPress websites. b. Copy the AFS Analytics code on your website. No need to do this if you use the AFS Analytics plugin. a. If you don't have a Google search console account yet, you will need to create one. Open an account on Google search console. b. Once you sign in, click on "add a site" button. a. Once you are connected to AFS Analytics, select your website's dashboard and click on “Account -> Edit Website info” in the main menu. 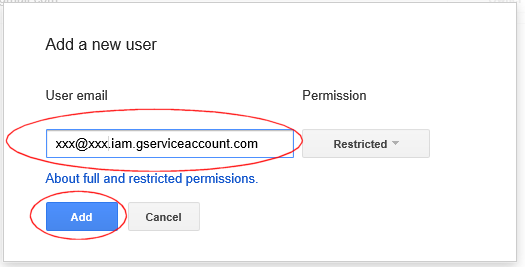 c.	In the “Google search console” tab, copy the email address displayed in “Authorise AFS Analytics to access your data” f field. d.	Sign in to your “Google search console” account. You need to allow AFS Analytics to access your account. Click on “Add or remove users” in the “Manage property” menu. e.	Click on the “Add a new user” button. 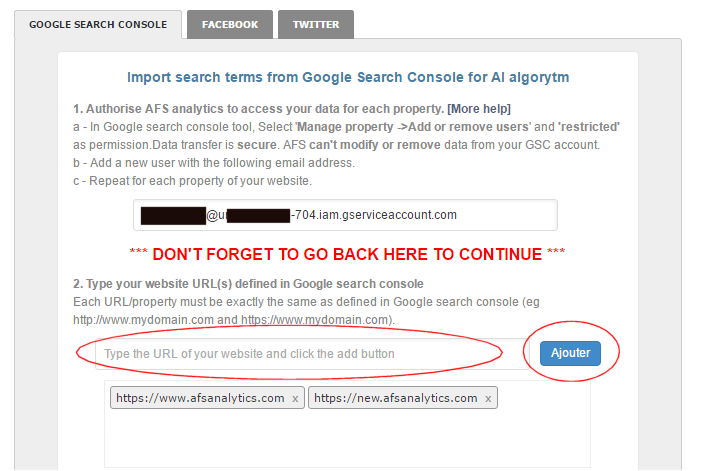 f. In the “Add a new user” box, , type or paste the e-mail address you previously copied on AFS Analytics. For permission select “restricted” and click the “Add” button. Note about security: Data between AFS Analytics and “Google search console” is transferred via a secure connection. AFS can’t modify, delete, remove or change your “Google search console” information or data. AFS can only read the keywords. 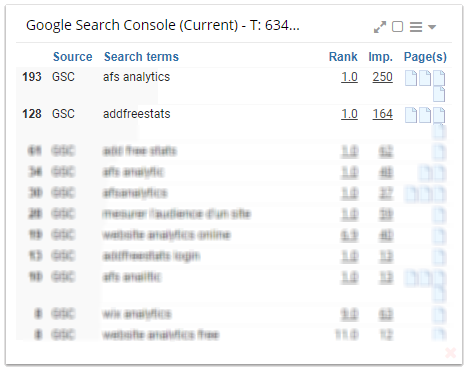 g . On AFS Analytics, in the “Third Party” box, enter the various URLs of your site defined in Google search console. Example: http://www.mydomain.com , https://www.mydomain.com for URL-prefix property or sc-domain:example.com for a Domain property ... Type one URL at a time and click on "Add". For URL-prefix property, repeat for each URL. h. Validate by clicking on the “Test and Save” button. If you have difficulties, don't hesitate to contact support. The search terms window offers a menu with two options. The reports period is the one defined in the dashboard. These reports are also available in the “Source” sub-menu on the left menu. a. Search terms : This option displays the search terms used by the visitors including the keywords recovered by the AI algorithm. b. Search Terms GSC: This option displays the search terms imported from your “Google search console” account. Click on the "people" icon to get the window with the visitors list. Click on the rank to get the history chart. Click on the impressions to get the history chart. Despite all our efforts, the algorithm can provide irrelevant results. In this case you can delete them from the database. To do this, display the report in full screen and click on the trash icon on the irrelevant keyword line. This article was written by Chris from AFS Analytics support team, 04 August 2018. Please contact-us for spelling correction, updates or additions.